Serve nostalgia neat or on the rocks. Designed to recall the elegance of the 1960s, this kit lends a bold, executive style to whiskey drinking. Serve nostalgia, neat or on the rocks. Serve nostalgia neat or on the rocks. Designed to recall the elegance of the 1960s, this kit lends a bold, executive style to whiskey drinking. 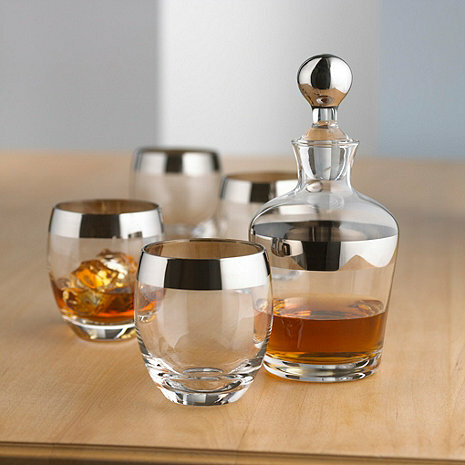 This mouth-blown, lead-free glass whiskey decanter set includes one Madison Avenue whiskey decanter and 4 Madison Avenue whiskey glasses. Hand wash only. Dimensions: Glasses: 4 "H, 17 oz., Decanter: 7 1/2"H, 32 OZ. Dimensions: Glasses: 4 "H, 17 oz., Decanter: 7 1/2”H, 32 OZ. what is the silver metal? BEST ANSWER: Silver based paint. - Food safe! Do you still have the slim decanter in stock? Can this set be engraved/personalized? BEST ANSWER: They only personalize these items separately not in a set. So you can purchase the glasses with an initial and the decanter with an initial or monogram. Yes, this product can be engraved and personalized. BEST ANSWER: Thank you for your International Purchase inquiry. Please visit our web site, choose the items and enter them into your shopping cart. Once in the cart go to the bottom of the checkout page and you will see a link for International Orders. This will take you to the processing site where you will see all applicable shipping fees, duties and taxes before you place your order. Got it from my husband’s birthday Just beautiful my husband loved it ! The decanter and glasses were a gift and delighted the recipient. Thank you. A nice set to highlight a favorite bourbon and accent a table or bar in a 1970s style. Also a good size glass for a proper pour.